Oregon football is turning change into a tradition of its own, a trend reflected on the most basic level of the program – the equipment. One thing has become clear about the Ducks’ uniforms: You either love ’em or you hate ’em. As a Duck fan, I love ’em. 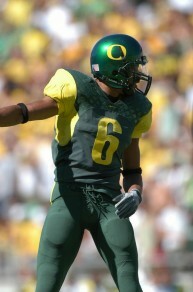 There is perhaps nothing more polarizing about the Oregon football program than its enormous arsenal of sleek uniforms. So many articles written about the Ducks lead with a joke or a remark, often in a condescending manner, about the team’s shiny helmets or flamboyant jerseys. Many fans flock to the Internet in search of leaked pictures of new jerseys or helmets while others could not care less for the utter “lack of tradition” found in the Ducks’ rapid rotation of uniforms. Those from other regions may look on with mild disgust (or even jealousy) at Oregon’s innovative outfits. With the recent upswing in concern for player safety, the Ducks’ sleek and often robotic-looking helmets have become a symbol of extensive technology created to actively combat concussions and other head injuries. 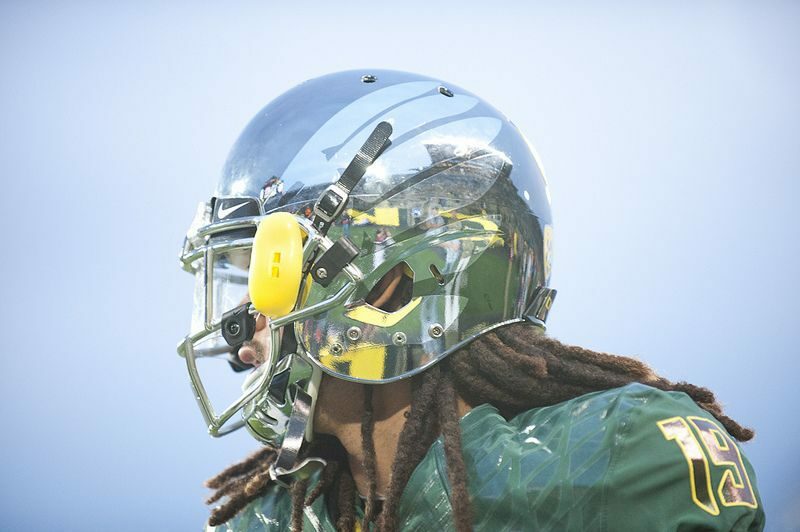 However, Oregon’s football helmets haven’t always subscribed to the same spectacular style of these modern lids. Freshman receiver Dwayne Stanford sporting one of Oregon’s latest helmet designs. In fact, Oregon’s football uniforms used to be quite run-of-the-mill. The team even chose to wear navy and yellow instead of green and yellow all the way up until 1925. This was still in the era of leather helmets and minimal body padding. The helmets of this time period looked about as plain and simple as you can imagine – brown leather sewn together covering the whole head but none of the face. This is no surprise, considering the fact that helmets were not required up until the late 1930s. The helmet was not exactly part of the “uniform,” as not everyone had to wear one. Knowing what we do now about how dangerous football collisions can be, this seems almost unimaginable. 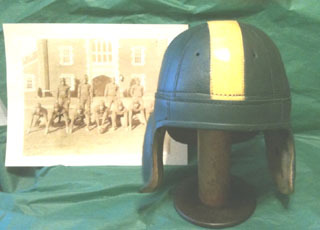 Replica leather football helmet depicting the Ducks’ 1940s lids. Nonetheless, Oregon’s helmets (as did the helmets at every school) remained both leather and optional for a significant part of its history. One thing was the same about this era, Oregon could not settle on one jersey. They alternated between the “bumble bee” style shirt with yellow and blue stripes and a solid navy top with a bright yellow “O” pasted right in the center. In 1939, the NCAA finally deemed helmets mandatory. This new requirement encouraged teams to get a bit more creative with their logos, patterns, and color schemes. It was at this point in time that the green and yellow helmets became prominent among the players at Oregon, and the customization on a small and simple scale began. In the 1950s, the Ducks moved away from the relatively plain green and yellow helmets by painting jersey numbers on the sides of their lids, now often considered a very “old-school” look still worn by the Alabamas of the world. It was also around this time that the Ducks began to wear real a logo on their helmets. It’s hard to believe that this trend started as late as the mid-1960s, but there you have it. 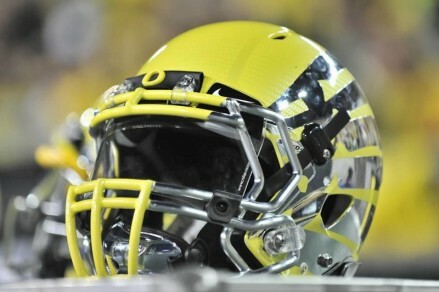 Initially, Oregon displayed the connected “U” and “O” on their protective lids. Receiver Demetrious Williams sporting the “O” logo back in 2003. One interesting fact concerning Oregon football’s helmet history is that the Ducks have never displayed the actual Duck. Interlocking letters? Yes. Jersey numbers? Yes. Plain green and yellow? Yes. But never the actual mascot! Though it appears prominently on much of the program’s apparel and memorabilia, it has never made an appearance on the helmets. Eventually the interlocking U and O letters were replaced by the distinct Oregon “O” that we know so well today. That “O” became one of the most popular gestures among the Oregon’s fan base. Spectators scream at the top of their lungs while pressing their thumbs and index fingers together to form the circular letter, making Autzen Stadium one of the toughest places to play in the country. That simple “O” persisted throughout the first decade of the 2000s, well into the Chip Kelly era, and lasted all the way up until the 2012 Rose Bowl. It was on that day that the Ducks emerged from the locker room in Pasadena with brilliant silver helmets with nothing but wings on the sides. The sheer brightness of the reflection on the helmets provoked allusions to the Greek myth of Icarus as he flew too close to the sun among those projecting an Oregon loss. However, the wings of the Ducks did not melt on that day, and they soared to a 45-38 victory. That success carried over into the 2012 season, as the many varieties of the new vibrant, winged helmets have continued to produce shock and awe among fans. Oregon has now posted a 13-1 record with these helmets. One of the most spectacular helmets in Oregon football history, worn by the Ducks in 2012. 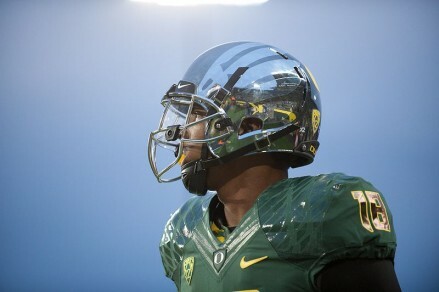 While these helmets are visually brilliant and spectacular, Oregon has not always displayed such flashy protective lids. The Ducks have had a rich history and varied display of different helmets throughout the past, but the wings of these new caps seem to represent the program’s recent unrelenting ascent to the top of the national standings.